It happens. You’re leaving for an important business trip – or you’re going on vacation – and the night before leaving, you realize that your teeth could stand to be a little bit brighter and whiter. What to do? Well, I have got three answers to your toughest problems. 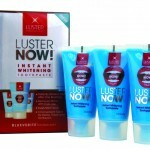 The fastest fix out there is the amazing new Luster Now! Instant teeth whitening formula, which just received a rave, rave, rave review in Allure Magazine, in a feature story about “Amazing Beauty Breakthroughs.” It works by using what the Luster Now chemists call “BluVerite technology,” an innovation that was developed by a dentist. BluVerite acts by depositing onto the tooth surface, thereby changing the optical properties and reducing the yellowness of the tooth. The proprietary formula creates a blue foam and results in an instant optical effect of whiter teeth that lasts for hours. As Allure stated, the BluVerite sinks into the pores of your teeth, and forms a temporary bond with the surface. And the blue cancels out any yellowness, giving the appearance of whiteness. Voila! You’ve got a dazzling Christie Brinkley smile in seconds. Stash it in your Samsonite and you’re very, very good to go. It comes in three adorable tubes that you can take in your purse, and tote bag to the office. Now you can give your teeth the blues – and I mean that in a totally positive way. If you’ve got an hour (and you’re stuck in your hotel room with nothing to do), I suggest the Luster 1 Hour White, developed by Denovations, the world’s largest supplier of private-label tooth whitening products. They created this amazing Luster 1 Hour White product, an easy-to-use, three-step process that is like a virtual visit to a cosmetic dentist. Stay tuned for one of my upcoming blogs, to read about my personal results. As you can see, the days of waiting weeks, days or even hours to get bright white teeth are long gone. Best of all, these Luster products are available at drugstores nationwide. So now this good news has gone from my lips – to yours.